On July 13, 2018, Citigroup (C) reported Q2 2018 financial results that beat on the bottom-line but that missed the top-line estimates. The market was not impressed, as shown by the fact that C shares finished the trading day down over 2%, which brought the YTD performance to approximately -10%. The U.S. banks in general have not performed well in the market over the last few months but Citigroup’s stock has continued to lag even its closest competitors. However, I believe that Citigroup’s capital return story will buy Mr. Mike Corbat, CEO, time to show the financial community that this once great bank is again worthy of investment dollars. To start, it did not help Citigroup’s case that JPMorgan (JPM) reported strong Q2 2018 financial results on the same day. 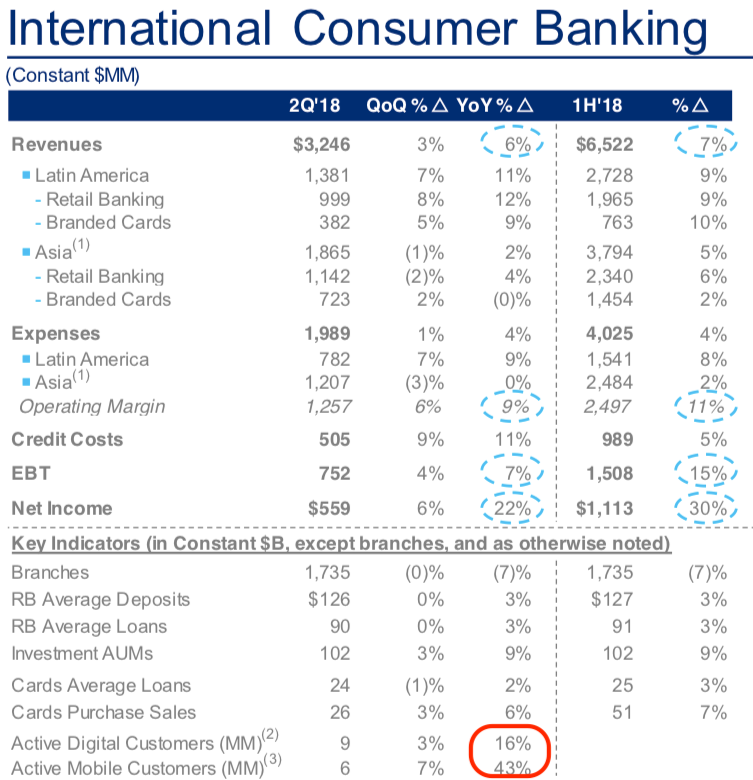 However, it was not all bad news for Citigroup as the bank was able to beat the consensus earnings estimate by ~5% and report solid growth within its International Consumer Banking (“ICB”) division. As shown, the bank’s effective tax rate for Q2 2018 was 24% (down from 32% for Q2 2017) and the average diluted share count was down 8% YoY. Financial engineering indeed played a significant role in Citigroup’s Q2 earnings beat but I believe that the benefits of the tax reform bill will be a catalyst for the bank’s earnings growth potential in the years ahead (a topic covered in this article). As such, I do not view the tax reform bill as a one-time benefit for the U.S. banks. From an operational standpoint, one of the few areas of improvement for Citigroup’s Q2 2018 results, other than the EPS growth, was the bank’s ICB division. On the second priority, we’ve continued to drive our digital transformation and invest for growth, while self funding these investments through efficiency savings. We’re focused on transforming the client experience across our franchise, driving digital solutions for both our consumer and institutional clients, while lowering our costs through automation or other service improvements. These efforts are leading to lower call volumes per account and higher digital engagement by our clients. And overall, we’ve improved our operating efficiency year-over-year for seven straight quarters and we’re on track to reach the low 50s by 2020. Citigroup’s earnings beat has been downplayed because it was largely fueled by a lower tax rate and buybacks but, in my mind, there is a lot to like about this bank in today’s environment. Yes, JPMorgan’s business performed better over the last three months but let’s remember that Citigroup is currently priced as the under-performer within the peer group. Therefore, you are able to buy C shares at an attractive price because of the underperformance but let’s also remember that investors will eventually be richly rewarded if [when] management is able to improve investor sentiment. It is hard to get too excited about Citigroup’s Q2 2018 results but, at the end of the day, I believe that investors should view this bank as a long-term capital return play, at least for the time being. This bank has consistently been an under-performer when it comes to its peer group – i.e., JPMorgan, Bank Of America (BAC) and Wells Fargo (NYSE:WFC) – and I do not think that investors should expect for this to change in the next quarter or two. That does not mean, however, that you should sell your C shares. The reason to own Citigroup right now, in my opinion, is because of the bank’s rising dividend (and future growth potential) and material buyback program. Simply put, Citigroup should be viewed as an attractively valued bank that has a capital return story that has legs. Citigroup’s stock is trading at a steep discount to its peer group based on several different metrics. Citigroup without a doubt deserves to trade at a discount and, as described above, the bank will likely continue to trade at a valuation below its peer group until management is able to show top-line growth potential. But, it helps the bull case for C shares that management has already shown their commitment to pay investors while the bank finds its footing. If you are willing (and able) to take a long-term view, this period of time is a great opportunity to accumulate a position in a bank that is buying back shares while they are trading at an extremely attractive valuation. Let’s now take a moment to consider just how shareholder-friendly this bank has become. The board recently approved an approximately 40% increase in its quarterly dividend (from $0.32 to $0.45) and announced a buyback program of $17.6B. As shown, Citigroup has materially grown its dividend over the last three years. Moreover, the $17.6B buyback program, which by the way is over only the next four quarters, represents approximately 10% of the bank’s total market capitalization. This alone is enough of a reason to hold onto your C shares, of course, in my opinion. Citigroup continues to under-perform the other large U.S. banks but, in my opinion, investors will be rewarded once management is able to show that the bank has revenue growth potential. I do believe, however, that the share buybacks/rising dividend will act as a floor for the stock. 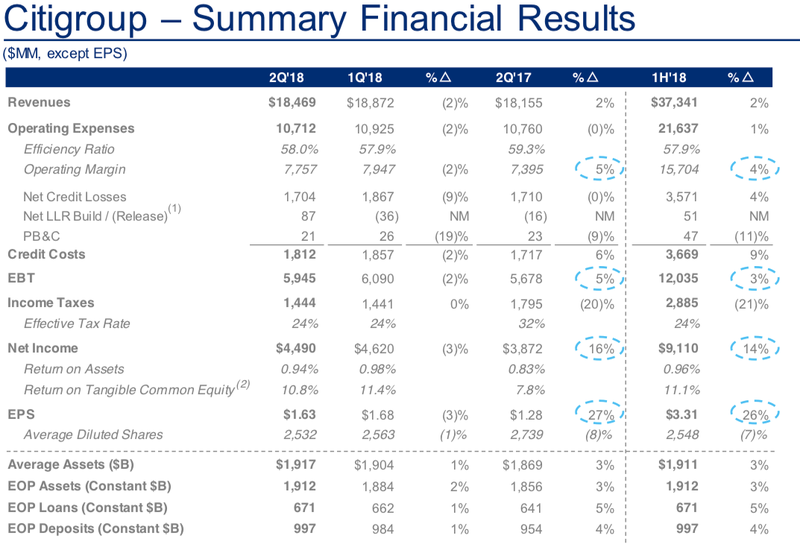 Citigroup’s Q2 2018 results were nothing to write home about but I believe that there is a lot to like about this bank as a long-term investment at today’s valuation. As previously described here, Citigroup (like Bank Of America) will benefit from positive trends in the current environment – i.e., rising rates, business-friendly regulatory changes, and lower corporate tax rates. Yes, C shares will not move higher in a material way until management wins over the market but, again, this bank is returning a tremendous amount of capital to shareholders while the story plays out. Is it worth the wait? Citigroup will likely not be a market beater in 2018 but I believe that the risk is to the upside for this large bank the further that you are able look out. As such, investors with a three-to-five year time horizon should consider any significant pullbacks as buying opportunities. Disclosure: I am/we are long C, BAC. Next articleiQIYI: Time To Pile In?